Making MySQL or PostgreSQL dumps and restores from Java and JSP is not very different than usual use of dump/restore tools. See how to perform these tasks in our Java hosting environment and what to be warned about. The command line utilities pg_dump, psql, mysql and mysqldump are called from Java and JSP code using the exec() method of java.lang.Runtime class. The code below is self explaining. It was written for one of our Java hosting clients who needed to know how to perform these tasks. It loads JDBC drivers so have them ready in WEB-INF/lib or comment out unused driver. Then it lists existing MySQL and PostgreSQL databases. You can then paste any of them into text field, choose database type and click Backup or Restore. You will be informed about success or failure. If dumping a database you will find the dump in your home directory. If restoring, it will be read from home directory too. You can modify the code if you want to have a dedciated directory for the dumps. Here goes screenshot of the script form and then some topics you should be aware of. and that it is only writable/readable by you (chmod 600 ~/.pgpass). Java does not need it but pg_dump does. mysqldump allows you to provide password as command line parameter but you may also choose to strip the parameter and use ~/.my.cnf file containing credentials. LOCK TABLES privilege is required to perform MySQL dump. cPanel defined database users have usually this privilege active when you chose ALL privileges when assigning user to a database. If you missed the privilege you will need to assign it. In case of cPanel drop the user and create it with proper privileges. Make sure you have write permissions for the directory you chose as dump destination. In case of cPanel you can by default write to any directory under your home directory. Make sure that the directory path you specify in Java code is absolute or make sure it translates to a valid path in writable location if you specified it as relative path. If you only provide a destination filename for the dump (like we did in the example code), it will be saved in your home directory. In rare cases mysqldump or pg_dump commands may be not in your path. Ask support for full path to the commands and place it in the Java/JSP code or modify your shell PATH variable (~/.bashrc). In case of cPanel server these tools will usually be in /usr/bin or /usr/local/bin. You can modify the command parameters in executeCmd string according to your needs (for example to strip database drop/create switch). 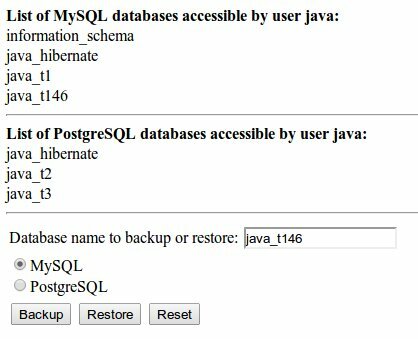 For PostgreSQL, instead of dumping to plain text format like we do in the script you can choose other formats and then load them with pg_restore. Check pg_dump and pg_restore manual pages. Here follows the code of backup_restore_database.jsp. See also similar article on database creation and deletion from Java and JSP code. If you have any comments or corrections you are welcome to post them below.